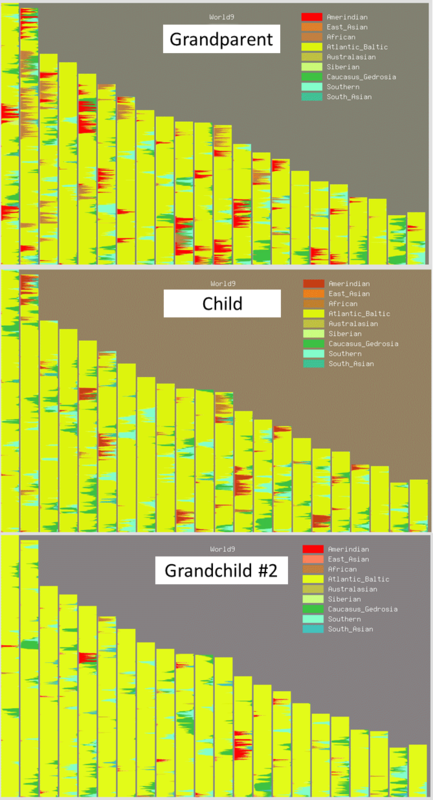 I posted a graphic online yesterday showing chromosome paintings for three generations, from a grandmother to her son to her grandson. I think these types of graphics are very interesting, but I shared this particular graphic because it – rather dramatically, I think – shows the loss of numerous African and Native American segments through just those three generations. 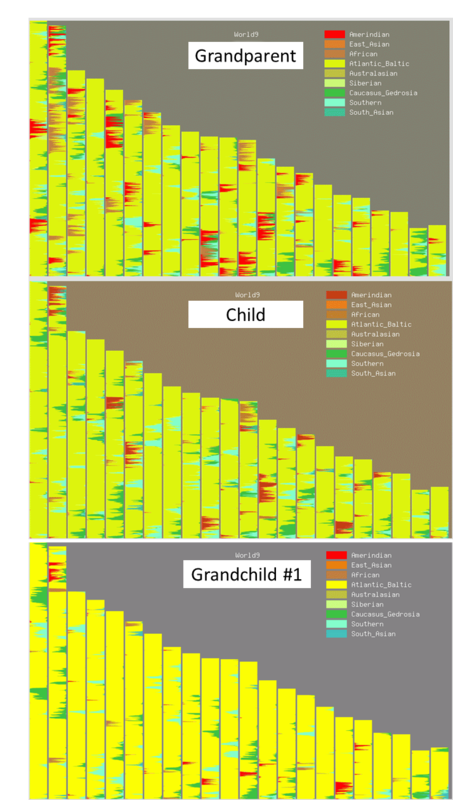 This 10% of non-European DNA, for example, quickly dwindles to almost non-existent in the grandchild, as shown in the images and tables below. Since I’ve actually tested two of the grandmother’s grandchildren, below are results for both. 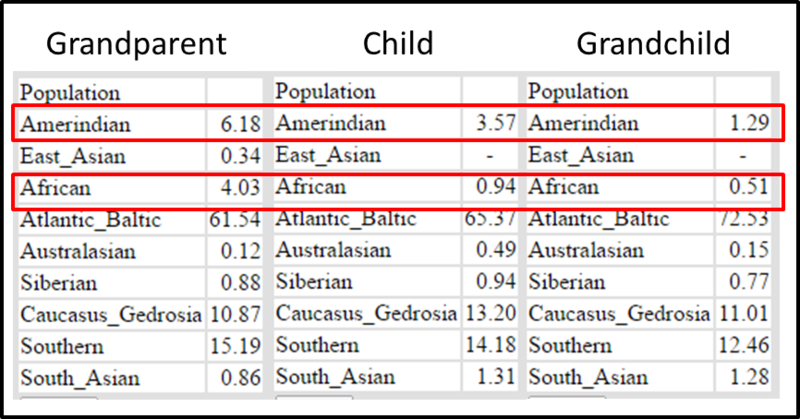 If I were reviewing the two grandchildren in Dodecad World9 (a GEDmatch admixture calculator) without having the previous two generations tested, it would be clear to me that there is true Native American ancestry. They both have one or two clear segments. However, I would be dubious of genetic African ancestry in Grandchild #1, and would conclude no genetic African ancestry in Grandchild #2. And, with just one more generation, all evidence of these African and Native American segments, so prevalent in the first generation, could be completely missing. I think there are numerous conclusions that can be gained from visualizations like this. First, we must always be cautious with EVERY admixture analysis. There is no such thing as a solid, foolproof ethnicity estimate. I have some confidence in the analysis above because the results are consistent among different companies and calculators, and because I’ve tracked segments rather than relying only on percentages. Second, lack of an ethnicity result is not evidence that the ethnicity is lacking from the genealogical heritage (see “Q&A: Everyone Has Two Family Trees – A Genealogical Tree and a Genetic Tree“). We carry a minuscule percentage of our recent ancestors’ DNA, and as a result we miss so much of the rich genetic heritage from which we descend. This is also why judging our ethnicity estimate based on our known genealogy is so problematic. Third, this is yet another reason why it is so vital to test the oldest generation! Although this exercise focuses on ethnicity, it applies just as equally to shared segments. Imagine those segments in the grandparent being segments shared with a second cousin, for example. By the grandchild’s generation, they are almost not related to that second cousin! Next Article The Genetic Genealogist Celebrates 10 Years of DNA! Thanks for this! I didn’t use the paint admixture tool so much but definitely the others that you showed including from 23andme. In Hawaii since there is a lot of controversy about blood quantum for specific programs targeting “native Hawaiians” which was set by Congress in 1922 defining anyone not less than 50% Hawaiian blood quantum and “Native Hawaiians” which is anyone descended from an aboriginal person in the Hawaiian islands prior to 1778, these tools can easily demonstrate with admixing with non-Hawaiians. And they usually are pretty accurate and was the basis of me helping to distinguish who were the foreign ancestors of my mother when trying to figure out who her biological parents were, although I knew the foreigners were on her mother’s side. So when it came to building trees, it definitely was useful and I knew who to look for as far as admixtures were concerned. Thanks, Blaine – this explanation helps a lot. One of my siblings looks so much like the Canadian First Nations people she hangs out with that many people assume she is partly Cree. She hasn’t had a DNA test, but I’m wondering if she might have inherited larger segments of Amerindian genes than I did. It will be interesting to investigate further. Hi, I tested my parents, myself, my first cousin, great aunt, my grandfather’s first cousin, etc. And I have tested my daughter. My mother depending on the tool used, has around 9 percent Native American, I have 4 percent, my daughter 1 percent. My first tests were done on 23andme on the old site. I was able to download the ancestry comp file and labeled her native dna from that file as a match for my genomemate pro (took a while too to get the cM’s). What I have confirmed is though there are relatively few matches for her from her Choctaw roots (known and in comparison with testers who are known Choctaws who are known matches), it has proven accurate thus far. I hate to say the ancestry comp is 100 percent yet too. A lot of my mother’s native DNA is on her X chromosome, and my daughter only received about 30 percent of her X from my mom, the rest is my Dad (submitted those kit numbers). Thus I think the significant drop in her genetic composition for native american. Just a guess but seems the most logical when you look at the inheritance. What I have found interesting is using my comparisons over 4 generations (maternal side) for my kits, with matches from my maternal great Aunt, my mom, myself and my daughter and watching the patterns. DNA is fascinating!